Development and density coming to Woodberry? Now that developer Christopher Mfume has agreed not to demolish two of Woodberry’s historic stone houses to build an apartment building, conversation in the community has broadened to include the implications of dense transit-oriented development along Baltimore’s Jones Falls Valley. “Eighty units, that’s a lot of people to shove into property that used to be two houses. And you expect all these people to use light rail?” asked Judy Finnell, who questioned Mfume’s plan to construct 80 units at the site, incorporating the stone houses into the design. She also questioned the $1,100- to $1,300-a-month rents planned by Mfume during a Woodberry Community Association meeting. While thanking Mfume for his decision not to raze the mill workers’ houses at 3511-3523 Clipper Road, the residents sought to understand how the area can absorb more development without adversely affecting the quality of life they enjoy now. 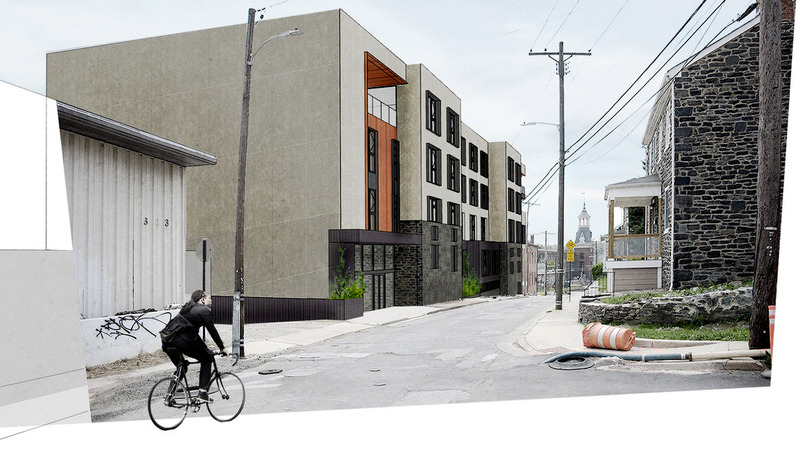 As currently planned, Woodberry Station would be one of Baltimore’s first “micro apartment” developments, consisting primarily of studios ranging in size from 350 to 450 square feet and a few one-bedroom corner units. The site is a short distance from the Woodberry light rail station, a stop on the Maryland Transit Administration line that runs from Hunt Valley to Linthicum. Mfume, head of CLD Partners and a son of former Maryland Congressman Kweisi Mfume, responded to some of the questions. 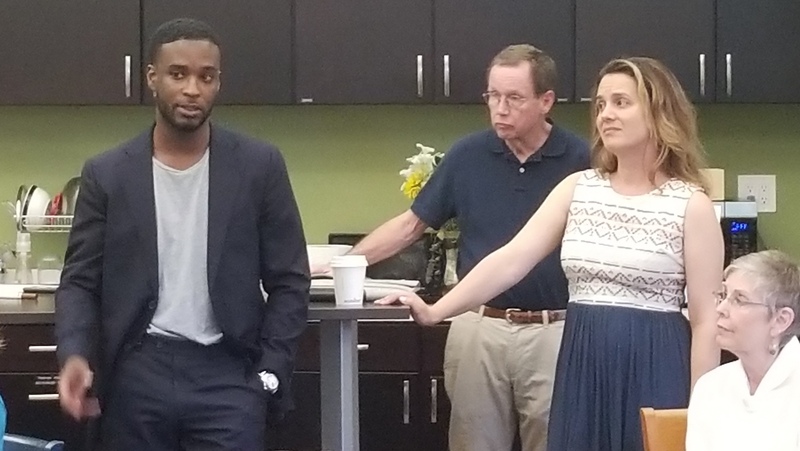 When residents expressed skepticism that micro units would attract renters, Mfume said he has been encouraged by the feedback his project has received from city planners and others. When a Maryland Institute College of Art graduate said she didn’t think MICA students would want to live in Woodberry because of its distance from the main campus, he disagreed. He said after the meeting he was encouraged by the number of people in the room who raised their hands when one resident asked who currently uses the light rail line to get to work. Primarily, though, Mfume left architects Pavlina Ilieva and Kuo Pao Lian, of PI.KL Studio, to present the project, which has had a rocky start. Residents and preservationists raised alarms when they saw demolition underway at the houses. Mfume promised last week to retain the original stone portions of the 170-year-old houses and make them part of the four-story apartment complex. Woodberry has come onto developers’ radar in part because of recent changes to the zoning code that encourage higher density development close to transit. But the controversy has raised awareness that the Jones Falls Valley is getting attention for its potential to be a “linear waterfront district,” the next Fells Point or Canton. Woodberry has come onto developers’ radar in part because of recent changes to the city’s zoning code, which encourage higher density development close to transit stops, including stations along the Light Rail line. Adopted last year, the zoning code identifies “Transit Oriented Development” parcels where city planners would like to see multi-family housing for residents who would rely on mass transit and bikes instead of cars. Woodberry is also attractive to developers because it is steeped in history yet is not a city-designated historic district where buildings are protected from demolition by the Commission for Historical and Architectural Preservation (CHAP). Property owners defeated an effort to make Woodberry a city historic district in the early 2000s. The absence of a historic district is one reason Mfume was able to obtain demolition permits for the stone houses on Clipper Road. Transit Oriented Development may be “something new” for Baltimore, but that’s what drew him to the Woodberry site, Mfume said. “Density makes more sense in locations where we can actually support it” with transportation, architect Ilieva added. But to some residents, more density and a large modern structure along a narrow street are precisely what they don’t like about this plan. His answer was, basically, no. The unit count was determined based on a financial model presented to his investors, he said, and the size was determined largely by the site and what the zoning code allows. He indicated that the unit count and number of levels were not subject to change. The design, meanwhile, is “still very much in the beginning” stages, Ilieva said, noting plans to choose exterior materials to help the building fit in with the historic community. 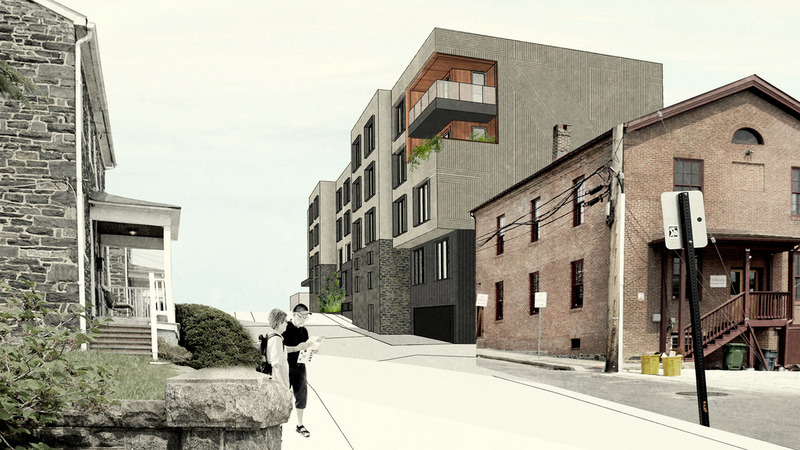 She talked about wanting to “erode” the exterior and carve out some residences on the corner. She said the building would rise about 60 feet and the bulk of the exterior would be clad by “high quality cementitious panels” with wood or Corten steel as accent materials. Ilieva said the designers had always considered reusing the stones from the two houses in the new construction, so they were happy with the developer’s decision to keep the entire structures. Lian and Mfume said the stone house at 3511 likely, under the current design, would be leased to a commercial tenant. They said they won’t know about a use for 3523 until they can get inside and see better what condition it’s in. “The buildings are pretty beat up on the inside,” Lian observed. The development team members said they will have other meetings with the community to discuss the evolving design, and that the project is scheduled to go back to the city’s Urban Design and Architecture Advisory Panel (UDAAP) on August 16. Mfume has obtained permits to tear off wooden additions to the stone houses and said he hopes to finish that demolition work in the next several weeks. 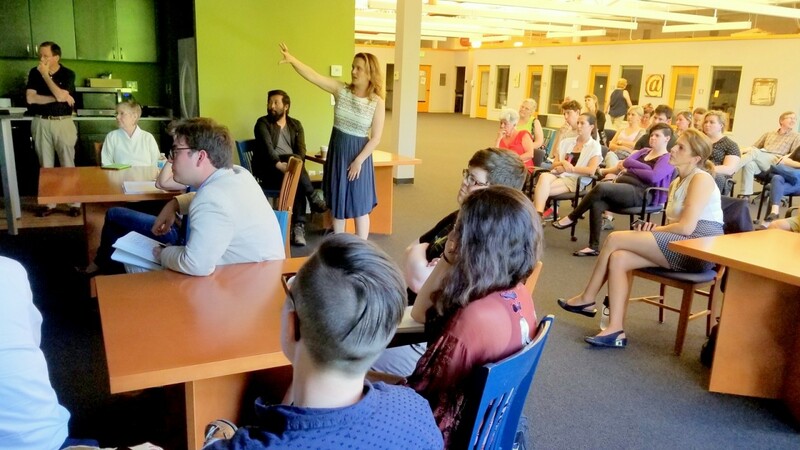 Several of the speakers encouraged the developer to “delve into” the history of the stone buildings and use what they learn to guide what happens next. They said they’d like to see the houses become memorable features of the project, and “read” as functioning stone structures, not just found objects grafted onto one side as an afterthought.